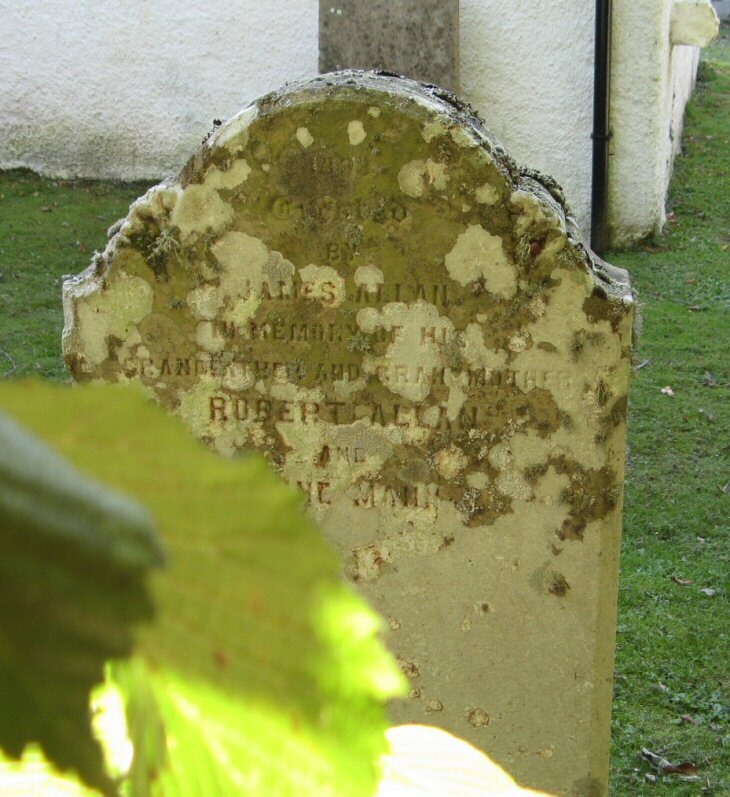 Ross & Cromarty Roots | Robert & Anne (Mann) Allan. Robert & Anne (Mann) Allan. Erected/by/JAMES ALLAN/in memory of his/grandfather and grandmother/ROBERT ALLAN/and/ANNE MANN. Picture Added on 28 March 2010. The maiden name of Anne is recorded as "Man" on the Banns published in both the parish of Forres and the parish of Dyke. Added by Jonathan Allan on 11 October 2011. Hello Jonathan, I remember looking at this and deciding it was Main, but I can be persuaded that it's Mann. Added by Roddie on 11 October 2011. Thanks for the comment Roddie. I think what is on the grave stone is "Mann" The death certificate for a son in 1880 gives his mother's name as "Ann Mann", so the name seems to have been corrupted over the years. Added by Jonathan on 13 October 2011. "Ann"s maiden is Mann.Have done a bit of research on them both and it all leads here hopefully this should b my 5th ggarandparent . Added by Wendy on 22 August 2018. Congratulations, Wendy! Could you tell me, please, who your 4th great grand parent is to help me see how we are related? Added by Jonathan Allan on 25 August 2018. Hi Jonathan my line comes thro Janet Allan (1792/1874) . I have d.o.b and d.o.d for Robert Allan with his parents being James Allan and Christian Thompson marriage 2 July 1767 dyke . I was hoping this gravestone would have a d.o.d for Ann Mann have a few possibilities I’m working on but nothing proving the facts yet . There s a James Mann noted on there marriage cert as her father . Added by Wendy on 26 August 2018. Added by Jonathan Allan on 03 September 2018.